There are few things more annoying than a lawn that won’t stay green and lush throughout the spring and summer. It’s during these times that we want to be able to enjoy our lawn without having to worry about dry, brown, and sometimes patchy lawns. Your first instinct may tell you that it’s brown because it hasn’t been watered enough. 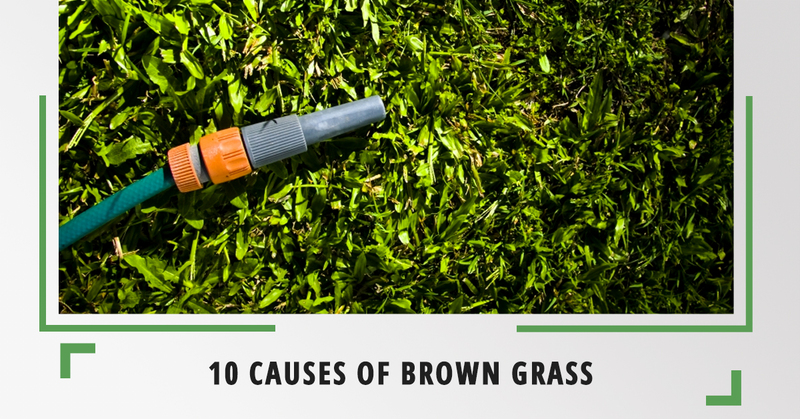 Although this certainly could be the case, it’s not the only cause of brown grass. In this blog, we’re going to look at some of the most common reasons that your lawn isn’t holding up to the lush green standards that you have for it. One of the most common reasons for brown grass is heat or drought. When exposed to periods of extreme heat and low humidity, grass goes dormant. Once the the temperature drops again and there’s more rain, the grass will regain its color. One way that you can check to see if it’s drought or hot weather that’s causing brown grass is by checking for prematurely dropping trees. This may mean that they’re dried out and in that case, your grass will be as well. If you want to brighten up your lawn a bit during this time, apply water to the affected area for about an hour ever 6-7 days. However productive it may seem, watering too much can also turn your grass brown. You may over accommodate for dry weather by watering too much and drowning your grass. This will cause your grass to have a short root system and be more open to infestation, weeds, and other diseases. Instead of watering a little bit each day, try watering heavily for one day and leaving it for a week or so to establish a deep root system. Many people will water too frequently and not realize how much they’re actually doing it. Lawn grubs or white grubs include Japanese beetles or European chafers. They are soil-inhibiting larva that eats roots and other organic substances in the soil. If left untreated, they’ll cause your grass to turn brown and become dry. So how will you know that it’s lawn grubs that causing the brown grass? You should cut out one square-foot of grass and if there are larvae underneath, allow your grass to dry out before watering it again. You may need to apply insecticide if the issue is bad enough. That’s right, weeds aren’t don’t just look terrible growing out of your lawn or garden, they’re actually turning your grass brown in the process. Pre-emergent herbicides should be applied in the spring to prevent them from growing out of control in the summertime. Lawn disease will often cause it to change to a more black, red, brown, or white color. If you believe your lawn may be diseased, you should contact a qualified lawn specialist to learn about possible courses of action. Other lawn maintenance techniques like aeration and thatch management can help to prevent lawn disease. Speak with a lawn specialist about creating a maintenance routine so that this problem doesn’t arise again. Cedar Mountain Tree and Lawn Care is your Top Rated Local® Tree and Lawn Care company in south-central Wyoming. If your grass is turning brown and you can’t figure out why, you need to call a reputable lawn expert that you know you can trust. We have over 30 years of experience working with homeowners and business owners in the area. If you have any questions or you’re ready to get started, contact us today.